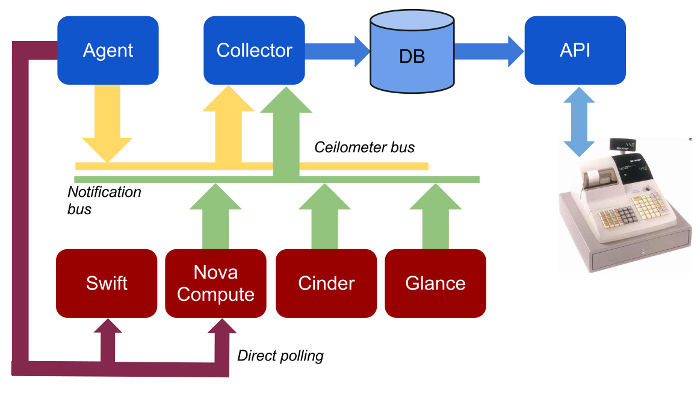 For the last months, I've been working on a metering project for OpenStack, so it's time to talk a bit about it. OpenStack is a growing cloud platform providing IaaS. A problem easily identified by everyone building a public cloud platform is that nothing is provided to retrieve the platform usage data. Some data are available in some places, but not everything is, and you have to do a lot of processing from the various components to get something useful in the end. But in order to bill customers that are using your public cloud platform, you need to do his. In this regard, a lot of companies running public OpenStack based infrastructure wrote their own solution to cover this functional areas, and to become able to bill theirs customers. To avoid everybody doing and maintaining such a stack in their corners, the Ceilometer has been created. The project aims to cover the metering aspect of the OpenStack components, pulling usage data from every components and storing them into a single place. It then offer a retrieving point for this data via a REST API. The initial specifications have been written in April this year, and actual implementation started in May. The project is currently worked on by me, Dreamhost and Canonical. We already have designed an architecture that we are implementing, and we hope to release a first usable version with Folsom. I did a presentation of this project yesterday at XLCloud, which has been very well received.